Wheel of the Year: A term for the seasons or cycles of Nature marked by the Sabbats of Wicca/Witchcraft. It is often symbolized by an eight-spoke wheel indicating each solstice and equinox, as well as the days that fall exactly between each, the midpoints or cross-quarters. Dates used relate to the Northern Hemisphere. In the Southern Hemisphere the Sabbats are reversed. A Gaelic festival marking the end of the harvest season and the beginning of winter. Also known as Halloween. I've written a little story about a witch and some ghosts who pay her a visit at Samhain. Yule/Winter Solstice - celebrating the rebirth of the sun. Explores the tradition of Santa and his elves in Finland. I haven't written any articles about Imbolc myself so I am re-directing my readers to an excellent article about the holiday of the Goddess Brigit by well known pagan author Mike Nichols. 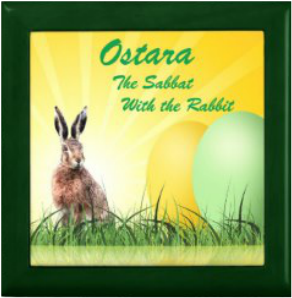 An article I wrote about the pagan celebration of the Spring Equinox, also known as Ostara. The Wheel of the Year has spun half way around from Samhain. It marks the beginning of summer. Let's learn a bit more about it. The Summer Solstice is the longest day of the year and the shortest night. Although modern calendars name this the first day of summer, the older pagan traditions marked May 1st as the beginning of summer. Thus the Summer Solstice marks the middle of summer. The days begin to get shorter until we reach the opposite solstice of winter also known as Yule. Lammas is also known as Lughnasadh, ((pronounced Loo-NAS-ah) is the first harvest festival of the three that are celebrated in the Wheel of the Year. The harvest of grain was welcomed and it was the custom of early Christians to bring a loaf of bread to the church to be blessed. Lughnasadh is a pagan festival giving honor to the god Lugh, a sun god and the god of crafts and skill, Festivals were scattered about the countryside and artistsans were gathered to display their wares. The names Lammas and Lughnasadh are interchangeable in modern Wicca. It has a complex history and story line and I bow to those who truly understand the spiritual message of abundance and gifts the sun and Mother Earth have provided for us. This video explains Lammas/Lughnasadh quite well. The autumnal equinox is much like the spring equinox in that it is a day that has an equal amount of day and night. To most pagans, it is the second of three harvest festivals. Many people choose to call it Harvest Home. On Mabon we celebrate with harvests of apples, squash, and nuts. I invited Arawyn Walense to tell us more about Mabon. He is also known as my husband and spirit mate who transitioned to the Summerland in 2017.